Ready for some unique gifts? Welcome to the Unique Gift Ideas Blog Hop Giveaway Event! Giveaway Bandit is giving away an OrGreenic™ 10″ Fry Pan! A blog hop is where we have a list of links (linky) at the bottom of the giveaway and you can hop from blog to blog entering to win more great prizes! It’s fantastic! 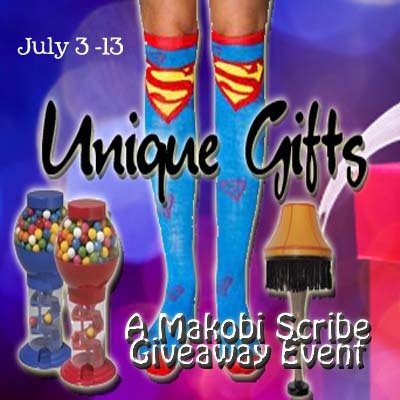 Makobi Scribe (link to http://makobiscribe.com/unique-gift-ideas) is hosting the Unique Gift Ideas Event with a Sumo Lounge Beanbag Chair as the grand prize! 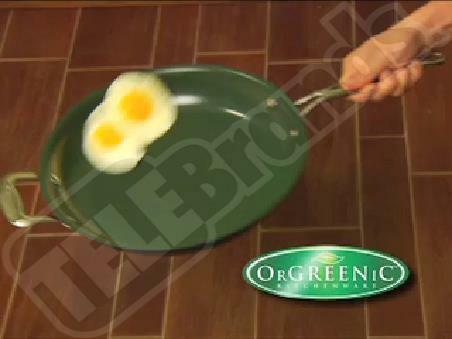 OrGreenic™ is the amazing new non-stick cookware with revolutionary ceramic coating. With ergonomic handles and lightweight design… OrGreenic™ crushes the competition! Is your non-stick pan a sticking nightmare? Does it always peel, chip and wear out? And scared of adding oil, grease and fat to your family’s diet year after year? The solution is OrGreenic™ Kitchenware. The amazing new non-stick cookware with revolutionary ceramic coating. With ergonomic handles and lightweight design, OrGreenic™ pans crush the competition! Now you can boil, bake, braise, steam, sauté, or fry without adding any oil, grease or fat. Foods never stick so you never scrub! Enter to win your very own OrGreenic 10″ fry pan! Giveaway ends July 13, 2012 at 11:59 pm EST. Giveaway is open to US and Canadian residents, 18 years of age and older. Enter via the giveaway form below. Remember to scroll down to enter to win the other great giveaways going on in this event! Good luck! Ceramic is the way to go! I learned that the Ergonomic Handle is cool to the touch. I learned that they will never flake or release toxic gases which is awesome! Learned that every piece has the same natural ceramic cooking surface so it’s easy to clean. I learned they never flake or release toxic gases. I learned that it does not have harmful PFOA’s which are a know carcinogen and can cause not only cancer but many other ailments. If it gets dull or damaged, they will replace it. I would love to win this!! Orgreenic is the best brand out there for nonstick, awesome healthy cooking!! I learned that it will last a lifetime or they will replace it – what a warranty for a pan that costs only $19.99. You can get 2 pans and 2 cookbooks for $19.99 + S+H. I learned that it sears in the juices and flavor of your food without releasing toxic gases. The pan I have the food sticks to it,I need one that it doesn’t do it and I don’t need oil. The handle is cool to the touch (vey important to me!! LOL) It also comes with a lifetime gaurantee! I learned that Ergonomic Handle is cool to the touch. I learned that you just have to run pan under water for cleaning it.Its easy. The pan will never flake or release toxic gases. Truly a green product! Has an Ergonomic Handle that is cool to touch and has a lifetime warrenty. Thanks for the giveaway. I learned that its replaceable for life, even if its my fault. Theres no toxic fumes to worry about. Come with a no fault lifetime warranty! I learned that every piece has the same natural ceramic cooking surface so it’s SUPER easy to clean. But, perhaps best of all, they will never flake or release toxic gases. Handle cool to the touch. Lasts a lifetime. My kind of pan. NOTHING STICKS TO THE PAN AND IT IS NON TOXIC COATING—AND I AM AT MY LIMIT ON FACEBOOK LIKES.SO I LIKE YOU ANYWAY…YOU ROCK MELANIE…. The ceramic coating keeps food from sticking. I learned that the handle is cool to touch. That every piece has the same natural ceramic cooking surface so it’s SUPER easy to clean. It has a ceramic coating that allows you to cook without oils! Sweet! And no teflony stuff to scrape off into your food! 🙁 Yuk! Sounds awesome! Haven’t got to try one yet but looking forward to it! I love getting new kitchen stuff! 🙂 Thanks for the giveaways! Orgreenic sears in the juices and flavor of your food without releasing toxic gases. I learned that Orgreenic cookware is non-stick up to ANY temperature, while some other material pots and pans are only non-stick up to 500 degrees Fahrenheit. Sold individually its a $500 value for you to try in your home for 30 days for 6 monthly payments of 49.99 and your shipping is free, that’s a combined savings of over $200! Wow that looks like some cookware! And the best thing is they will never flake or release toxic gases. That is really awesome! I didn’t realize they made a complete set of cookware. I had only seen the fry pan… which came highly recommended by two friends that have used it. I learned that the pan will never flake or release toxic gases. I learned that they have developed a complete line of Orgreenic Cookware, the Orgreenic Complete Gourmet 16 piece Collection. It healthy to cook on and has a great price. I learned that the 10′ pan is now available at CVS, Walmart, Walgreens, Bed Bath & Beyond, Rite Aid, Target, Kitchen Collection, KMart, Boscovs, Sears, Fred’s, Joann Fabric and other local retailers! I think it is pretty kool that I found out they are ceramic coated instead of teflon coating. No oil is needed, which is better for my family’s health! Haven’t gotten new cookware in years. These pans have a lifetime guarantee. These pans sound like something that I need. I can’t like any new pages. It doesn’t work when I click. Orgreenic lets you cook healthy food safely and quickly! Because of its super hard, durable all natural ceramic coating, Orgreenic sears in the juices and flavor of your food without releasing toxic gases. And, you don’t need to add high calorie oils and butter! Best of all, absolutely nothing sticks to it! Just run the sauté pan under water and it wipes clean! Because of all this, I learned that I NEED one!!! Or actually the whole set!! that it’s protected by a lifetime warranty!! that’s awesome!! I see that it is Natural ceramic and organic. Wow…how impressive all the way around! No toxic gases and easy cleaning. Orgeenic has developed a complete line of Orgreenic Cookware, the Orgreenic Complete Gourmet 16 piece Collection. I had no idea that Ceramic had this non-stick attribute! Orgreenic sears in the juices and flavor of your food without releasing toxic gases. And, you don’t need to add high calorie oils and butter! Would love to win it!! If it dulls or is damaged, you are protected by a lifetime warranty! cooks food safely and fast. sears in juices. Learned that it doesn’t have no harmful PFOA & it has a lifetime warranty. Learned that it doesn’t have no harmful PFOA & it does have a lifetime warranty. Cool handle, great for my husband as he has no feeling in his fingers, so he has less chance of getting burned. I learned you can cook withoutadded fats such as butter or oil. Food will not stick, so no need to scrub. The handle stays cool to the touch. I’ve been wanting to try one! Thank you and Good Luck to all!! I learned that all Orgreenic pieces have the same natural ceramic cooking surface so they will never flake or release toxic gases. The ceramic coating does not release harmful toxic gasses while cooking food. They make 16 different pots and pans. Non-Stick, Green Ceramic Coating, Cool to the touch handles…. yes time to ditch the thrift store cookware. Orgreenic cookware is non-stick up to ANY temperature, while some other material pots and pans are only non-stick up to 500 degrees Fahrenheit. Ergonomic handle is cool to the touch! I learned I can buy the whole 16-pc collection! I learned that the pans have no harmful PFOA! I learned that the PFOA is nonexistant. I think this is pretty important. I learned that Orgreenic sears in the juices and flavor of your food without releasing toxic gases. A complete set of this cookware is only 19.99 plus shipping! It withstands thousands of abrasive scrubs! That they have a 16 piece collection, not just a fry pan! Their pots are made to last a lifetime. I learned every piece has the same natural ceramic cooking surface so it’s SUPER easy to clean. But, perhaps best of all, they will never flake or release toxic gases. Today only, you get the amazing 10″ Orgreenic sauté pan and cookbook for just $19.99 plus $7.99 shipping and handling. I learned and loved that the handles on Orgreenic pots and pans are made to stay cool to the touch while you cook! I learned that your Orgreenic pan has a lifetime warranty!